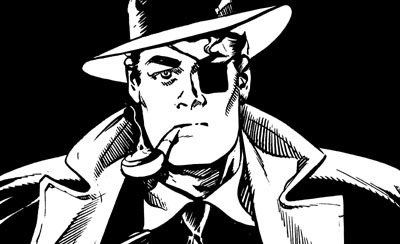 At the height of The Spirit's popularity in the late 40s, Will Eisner tried his hand at several new characters and titles. One of these was a tough, pipe-smoking cop with an eyepatch, JOHN LAW, and his streetwise helper, NUBBIN the SHOE SHINE BOY. The John Law/Nubbin concept was eventually shelved when sales of Eisner's other new ventures, Kewpies and Baseball Comics didn't meet expectations. But now, new, authorized adventures of John Law and Nubbin have been produced by award-winning Australian writer/artist Gary Chaloner. These new adventures also feature many other Eisner creations including Lady Luck and Mr Mystic.